The international Silk Way Rally (July 5-13) is over with a top-ten finish for a natural gas-fueled KAMAZ truck. 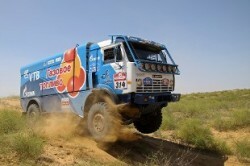 The KAMAZ 4911 completed all seven stages of the race in less than 42 hours, just 5.5 hours behind the leader. Most of the 2,700 kilometer route ran off-road, through sands and steppes. Summing up the results of the race, the team finished eighth in the overall ranking of 22 trucks that completed the rally. The truck’s team consisted of Sergey Kupriyanov Press Secretary of the Gazprom Management Committee Chairman, Alexander Kupriyanov and Anatoly Tanin. “We tested the gas equipment under the most extreme conditions possible for a vehicle. The outcome surpassed all the wildest hopes. Finishing eighth among the trucks and eighteenth in the overall ranking is absolutely awesome for the non-professional team. It is an impressive result of our teamwork. We are completely happy!” Sergey Kupriyanov said. The natural gas-fueled KAMAZ is a special model of a sport truck vehicle. It was customized by the KAMAZ Master team with Gazprom’s assistance in order to promote natural gas use as a vehicle fuel.